The Thunder needed every bit of it — forward Paul George, the NBA's No. 2 scorer and league leader in steals, missed his third straight game with a sore right shoulder. Oklahoma City supported Westbrook's late surge by holding the Grizzlies to 6-for-21 shooting in the fourth. 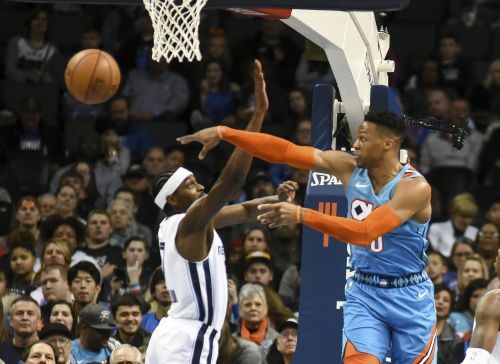 "One of the things we talked about that I said before the game tonight is that we've got to create a defensive identity regardless,'" Thunder coach Billy Donovan said. "We have to defend at a higher level every single night. Offensively, we struggled to get any kind of flow or continuity there, but I give our guys credit — they still tried to work as hard as they could to defend, even though offensively, we had our challenges." Mike Conley, the team's floor general and leading scorer, sat out with general soreness. Memphis coach J.B. Bickerstaff said Conley's presence was missed in the fourth quarter. "I think the guys put forth a hell of an effort to get themselves an opportunity to win the game, but it's a matter of learning who we are and who gets the touches where," Bickerstaff explained. "You know in the fourth quarter we rely heavily on Mike, so it was somebody different we were having to find tonight, and that's just a matter of us getting comfortable and familiar with one another and growing and learning from it." After Wright made a layup to trim the Thunder's lead to two, Oklahoma City's Terrance Ferguson hit two free throws with 6.5 seconds left to seal the win. Thunder forward Abdel Nader on the team's losing streak: "I think everybody was caught up, you know? I think we lost four in a row coming into tonight, and everybody gets really caught up in that. When you really look at the stats and watch film, it is all one- or two-possession games against some really good teams. Like I said, we have some things we definitely need to clean up, but this was a good step forward to get the job done."